Okay, you can't really become the king of the world by stacking three pistons. For that, you have to stack four pistons. Seriously though, stacking pistons is an incredibly useful thing to know how to do, and it can be used to make invisible doors, hidden staircases, portcullises, elevators, and who even knows what else. 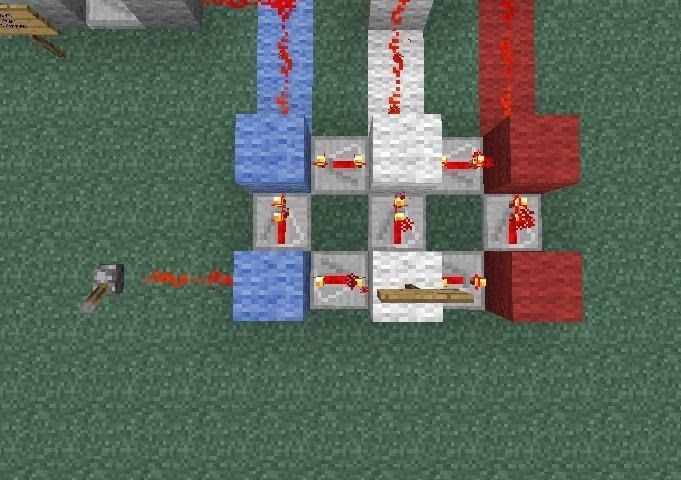 The key to stacking three pistons is a redstone device known as a falling edge trigger, as well as something called an ABBA switch. Check out this video of it in action! Before we get into the proper tutorial, let me show you how to build a falling edge trigger. 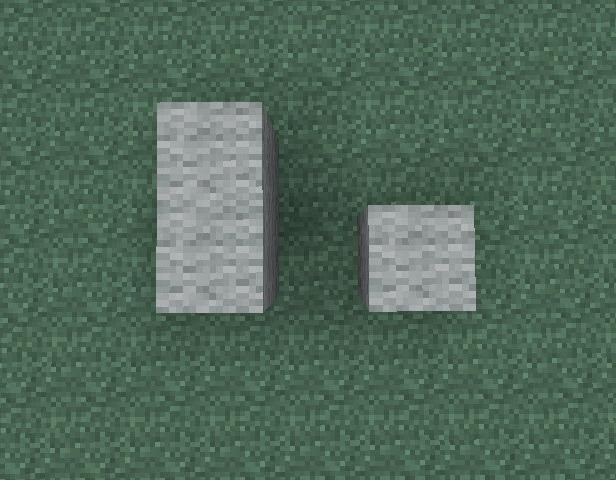 A falling edge trigger is so named because it only fires on the falling edge of redstone power. 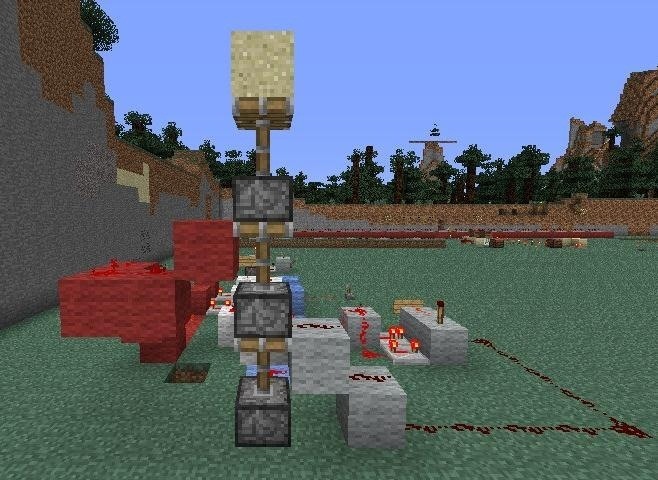 That is, it doesn't fire when the power is turned on, and it doesn't fire when the power is turned off, but it only fires in the transition from on to off, on the falling edge of the redstone power. Add two repeaters pointing at the set of two blocks. The one on the bottom should have no delay, and the one on the top should have max delay. Now add two torches, one on top of the top block, and one on the side of the bottom block. 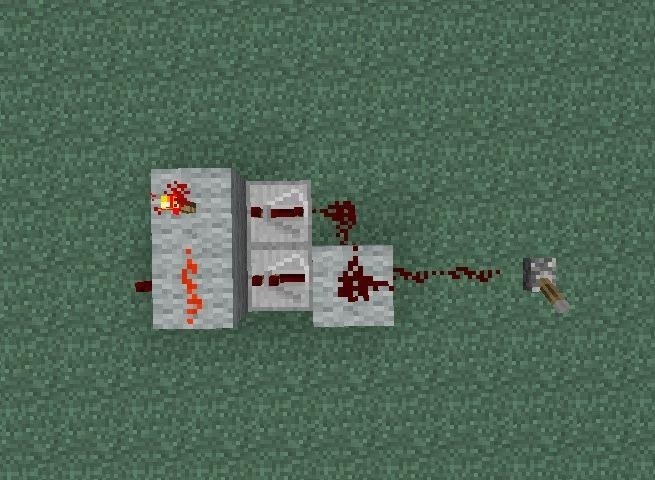 Lastly, fill in redstone wire, using the right-most block as the input and the left-most redstone torch as the output. And that's all there is to it! Congratulations, you've just made a falling edge trigger! On to the Piston Stacking! The heart of your stacked pistons is going to be an ABBA switch, as I mentioned before. 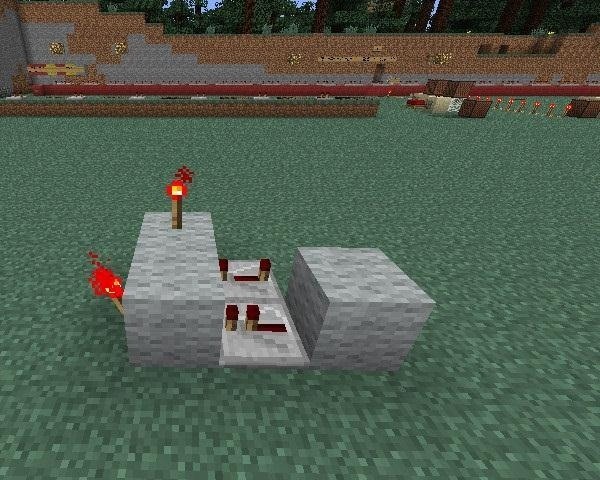 They're really simple and cause your redstone to turn off in the reverse order it was turned on in. For more detail, you can either see the earlier tutorial on ABBA switches, or watch the video above. Here's what your ABBA switch should look like. Note that I've color-coded it so that it will be easier to parse. 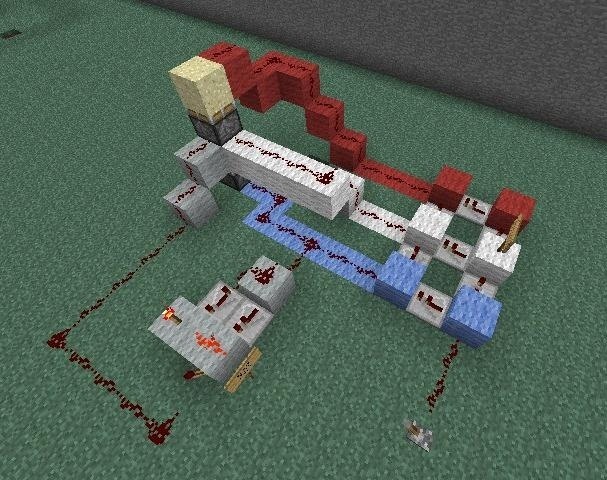 The red wool is the part attached to the top piston, the white wool is attached to the middle piston, and the blue wool is attached to the bottom piston. Remember that the bottom piston must fire first, or else it won't work properly. Also remember that this will only work using sticky pistons. If you use non-sticky pistons, you'll be able to extend them just fine, but they won't contract again afterward! So, this part is pretty easy. Just connect your ABBA switch to your stack of pistons. 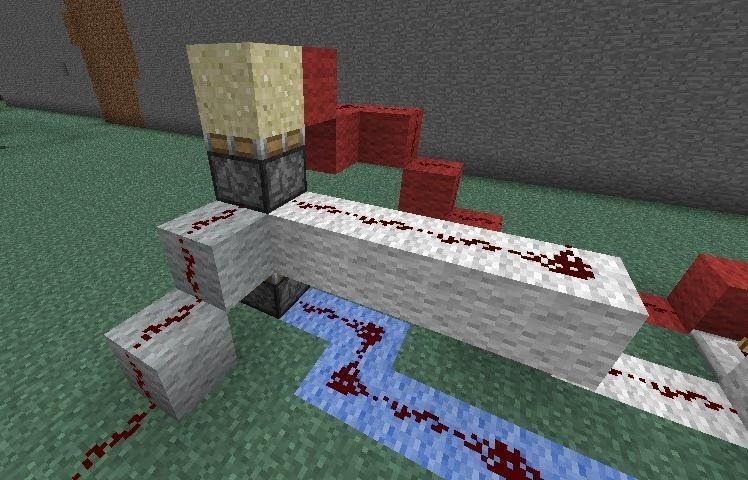 Make sure your blue area connects to the bottom piston, your white connects to the middle piston, and your red connects to the top piston. 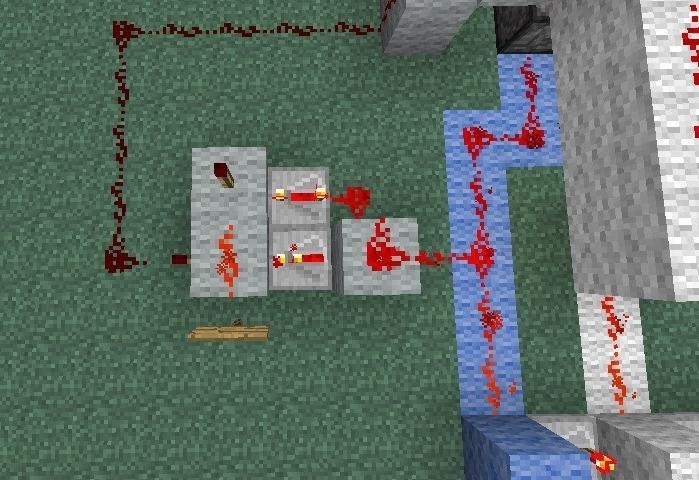 However, what you'll note in the picture below is that your top redstone wire, the red wool, doesn't actually connect to the top block when they're all retracted. 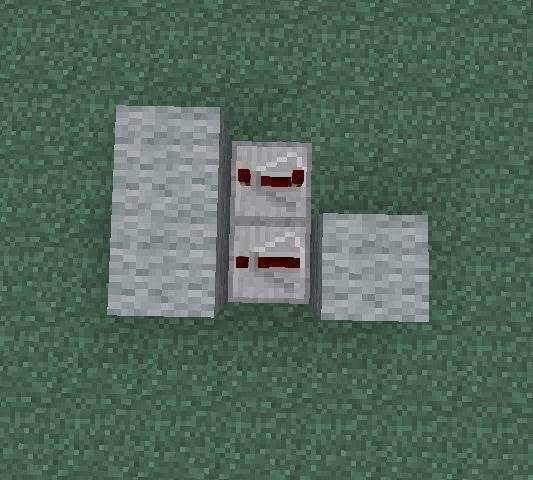 That's because the red wool only need to be powered when the block is already moved upward from the bottom pistons. The only really tricky part at this stage is making sure that your wires don't cross. You may also have noticed that there's four colors of wool in these photos: red, white, blue, and gray. I've used gray to represent the falling edge trigger so that it's clear where exactly it is. What you want to do is attach your falling edge trigger to the blue wool; that is, you want it to be attached to the wire powering your bottom block. The reason for this is that your falling edge trigger should be the last thing that fires. That's really all there is to it! Once you understand the principles of the ABBA switch and the falling edge trigger, the rest is simple! How To: Build a Piston-Train Tug-O-War Game in Minecraft 1.3. 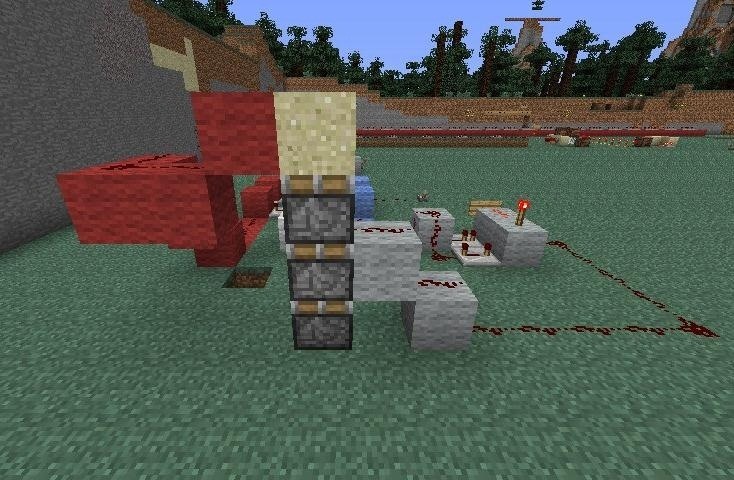 News: No More Redstone Delay—Transmit Power at the Speed of Lightning! Oh, and please don't submit it as only a video. My laptop does not like videos. Thanks! P.S. - I will suggest more ideas when/if all of the above are done. Thanks for a great tutorial! This got me started trying to get four pistons to stack and retract, and when I managed that I almost felt like a king, as you said. But then I realized that there was no way to get a top block of dirt to fall with the stack, so I continued to work on it. Finally I managed to get five pistons to stack and retract and pull down a block of dirt with them! It's not as neat and tidy as it could be, but it works (as of 1.7.9). Thanks for getting me started! Maybe I can become king for a day?